The Panthers will take on the Greyhounds at 11 a.m. on Wednesday, Dec. 19, 2018 at AT&T Stadium in Arlington. Here's everything you need to know about the game. 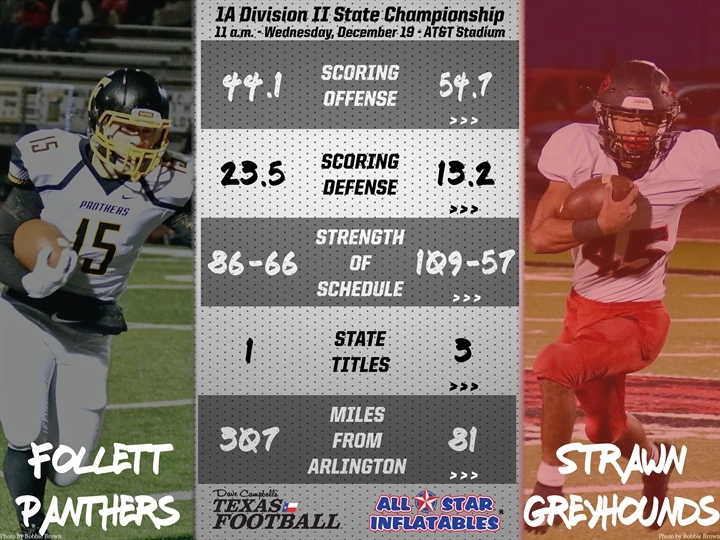 A rematch of the 2008 DI state championship game pits the Strawn Greyhounds versus the Follett Panthers. The Follett Panthers, under first year head coach Andy Copley, are making their sixth title game appearance and will be coming in as underdogs. They have perfected an old school style of grind it out game running a tight offense that will milk the clock. 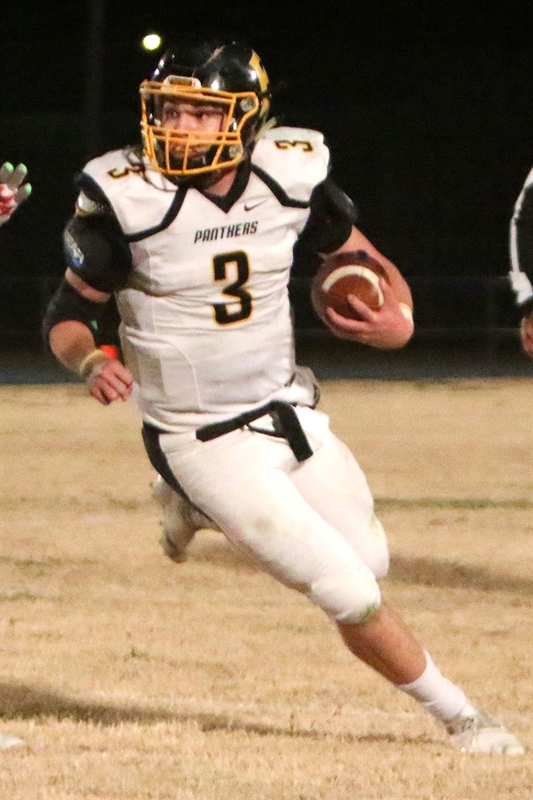 QB Christian Barber runs the offense, RB Dylan Howard ( is the main ball carrier, but backs Luis Loya and Josh Stuart are key players in the Panthers “five yards and a cloud of dust” rushing attack. What really gives the Panthers teeth is their overall team size, for a DII team they are very sizeable and strong which is why they are so successful at the power run game. Strawn has been the #1 team in DII since day one, don’t let their two losses fool you, as they were to DI #1 McLean and DI semi-finalist Garden City. 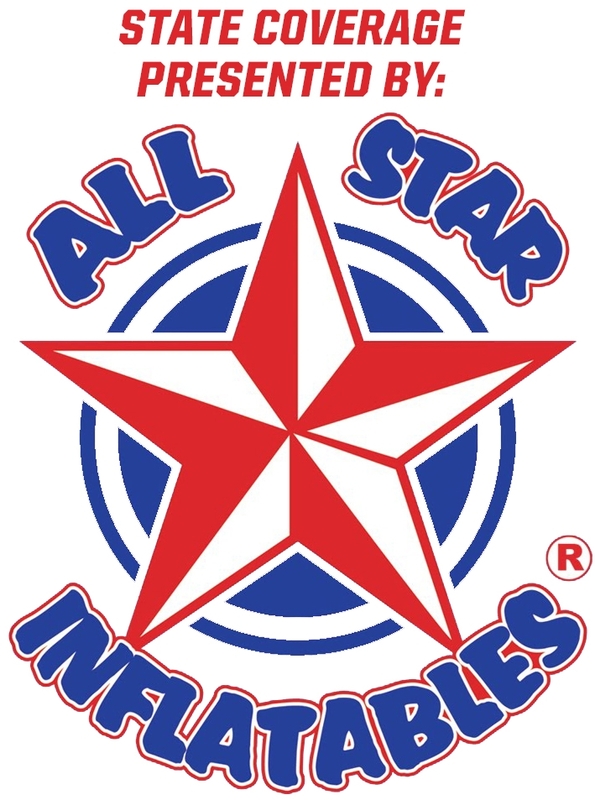 So many returning all-state players off last season state championship team makes them the clear favorites in this game. The Greyhounds have a good balance of size and speed which makes them so deadly on offense and defense. Power backs Tanner Hodgkins (5-11, 195) and Ivan Ruiz (5-10, 195) pair well with speedy backs Julian Fraga and Carlos Villanueva. The size and strength of their defensive front Hodgkins, Ruiz and Marco Lopez balances with their fast secondary of Villanueva, JW Montgomery, and Jr Cervantes. 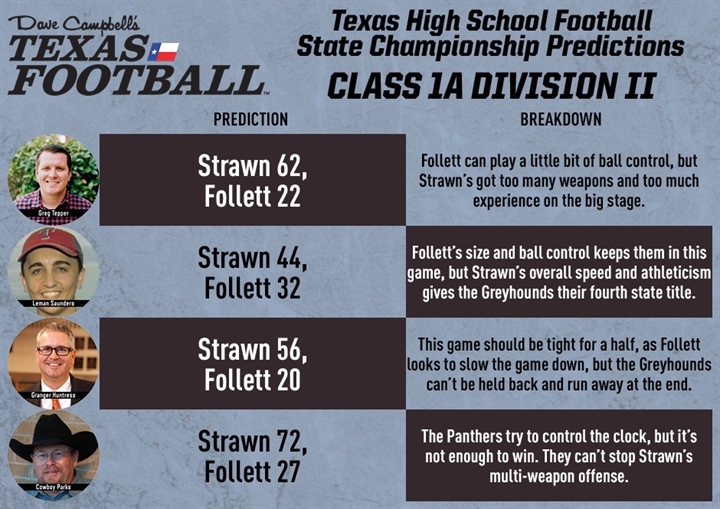 In order to win Follett has to play a perfect game, jump out to an early lead, win the turnover battle, convert every extra point, and make Strawn play their type of game which will make the clock a big enemy of the Greyhounds. All that is very possible, especially with the overall size of the Follett team which can grind out five-seven yards a carry at a time and set up their passing game with Barber to pick apart Strawn’s defense. However, it is Strawn they are going up against. The Greyhounds size on the line will be able to match up well with Follett’s and the same goes for the Greyhounds power running game. I think the speed of the Greyhounds combined with the fact that they have more weapons in their arsenal for the Panthers to worry about will be the difference… but Follett will put up a great fight! Christian Barber, QB/LB – The play maker on both offense (66-98 for 1,111 yards 19 TDs) and defense (93 tackles) for Follett is Barber, he is a big downhill runner averaging 11.1 ypc and has a canon of an arm. Dylan Howard, RB/DB – Howard (138-1,068 yards, 19 TDs) get the bulk of the carries for the Panthers. Fernando Cruz, K/DB – 65/70 PATs and 3/4 FG on the season, Cruz is arguably the best kicker in 1A and when PAT kicks are worth two points it is an extremely big advantage. Tanner Hodgkins, RB/DL – Hard hitting running back and linebacker, he averages over 10 ypc and leads the team with 124 tackles including 31 tackles for a loss. Carlos Villanueva, QB/S – Has rushed for 13 TDs and thrown for 11 TDs, Villanueva is a dual threat offensively. Julian Fraga, RB/CB – Fraga (93-934 yards, 26 TDs) is the team’s leading rusher in a rushing attack that is pretty balanced between four backs and leading receiver (12-201 yards, 6 TDs) who is also a dangerous kick returner. The game will be streamed on the Fox Sports Go app.